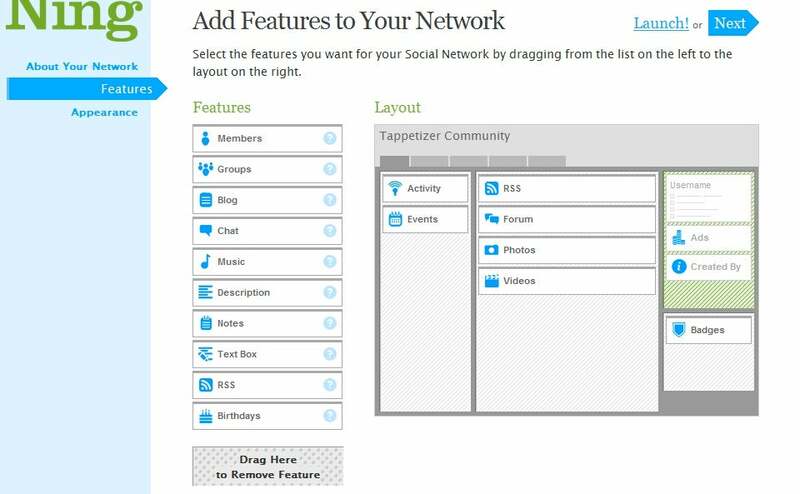 Ning lets you choose which features to add to your social network; you can place them by dragging them to any position. Upgrade from the break-room bulletin board and one-way customer e-mail lists--your business can take advantage of its own Facebook-like social network. You might try Facebook itself, of course, but the clash of business and personal communications could leave your vacation photos mingling with company news, and could lead to a lot of goofing off on company time. 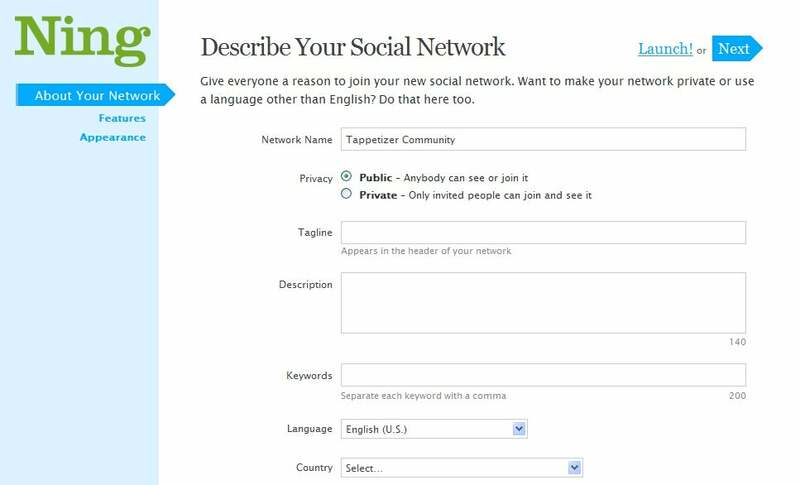 Instead, turn to a social network platform to make your own distinct site. Many services, including Grou.ps and SocialGO, offer functionality similar to that of Facebook; but in this tutorial I'll focus on Ning, which has been established for a few years and offers customization tools that can make your site behave almost any way you want. Within your company, you could rely on a Ning social network to maintain schedules for anything from managing workgroup projects to organizing an office softball team. Calendar tools, blog-style posts, comments, and other systems could help connect people. And you could post photos and videos to recap events. You could also use Ning to collaborate internally, updating everyone on a project's status, leaving ideas about new goals, recapping meetings, and otherwise keeping the office in sync. Best of all, nearly anyone can run the setup process, so you won't have to waste tech or design resources by getting those staffers involved. But Ning is especially powerful for building a space in which to interact with customers. Think of the service as a companion to your company's Web presence. Your Ning social network can live at its own URL, as in mycompany.ning.com, or you can integrate it as a subdomain of your site, as in community.mycompany.com. Ning's core functionality is free; you can create a site with a mycompany.ning.com URL in minutes. Such sites should be fine for most intra-office situations. To have Ning appear at a custom URL and to remove some of the site's branding and ads, however, you need to pay a monthly fee. 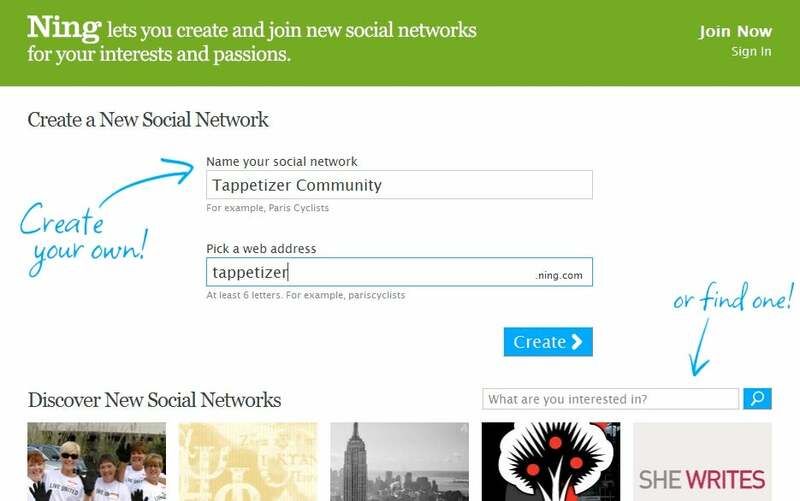 Create a new social network by entering a name for it and giving it a subdomain on Ning's site. To get started, visit Ning.com and walk through the prompts to set up your site. Enter a name for your network and a URL prefix (the mycompany in mycompany.ning.com). Click Create, and the screen will prompt you to either sign in to an existing Ning account or create a new one. Spend some time writing attractive, accurate descriptions of your social network. This is important for attracting new users. On the Describe page, enter a succinct tagline, a description, and keywords. Use these fields, especially the keywords, to help people find your network; consider using product names or other popular terms that relate to your site. Use the radio buttons to make the network public or private. Click Next. On the Features page, click View all features to see every choice. Each module represents a feature for your network, such as blogging, video posts, and an event calendar. Drag them into your layout, and order them as you wish within the columns. To remove items, drag them out of the layout, to the left. Click a question-mark icon to get a description of that function. Click Next. On the Customize Appearance screen, pick a template for your network, and then scroll down to make further changes to the design. You can swap in different colors and fonts as you go along; it's a good idea to match them to the look of your company's existing Web site. Click All Options to customize the choices even more and to upload your own images to use in the templates. If you know how to manage CSS, click Advanced to import or change the style sheet, which gives you complete control over your site's appearance and layout. Click Launch when you're satisfied. After building the site, you can return at any time to make updates. Visit your site page--log in if needed--and click the Manage link. You can adjust the site features, layout, and other aspects. For example, be sure to click Manage, Network Information to find the prompt to upload a network logo to overwrite the generic Ning one.